A monitoring graph for GPU temperature is now available in Stability Test mode. This graph allows you to see the GPU temperature evolution for the last 16 minutes (1000 seconds to be exact). The graph displays the minimum, maximum and current temperatures. The use of an OpenGL 3.0 rendering context. Currently, only NVIDIA provides an OpenGL 3.0 driver and all videocards from GeForce 8 to the latest GeForce GTX 2xx support this new version of OpenGL. I didn’t add new OpenGL 3.0 functionnalities in FurMark rendering code. The OpenGL 3.0 rendering path uses the same functions than OpenGL 2.1 rendering path. So why an OpenGL 3.0 rendering context? Just to see if it works in the real world, if it improves performance, if it has not compatibility problem. In a word, it’s more a test than a killer-feature! Of course, if the graphics system does not support OpenGL 3.0, the OpenGL 2.1 path is used. If you have an OpenGL 3.0 capable graphics card, you can test the difference between both rendering context using the /no_gl3_ctx parameter in command line. This parameter forces the use of an OpenGL 2.1 context. Post-Processing Pass. I added a checkbox that allows the user to enable or disable the post-processing pass (default: disabled). The post-processing pass adds an additional processing to the final image and allows to increase GPU workload in the pixels processing. Furthermore, the post-processing effect is now fully programmable. You can then code you own post-processing effect. The post-processing effect is available in the post-processing-fx.xml file in FurMark’s folder. I will publish shortly a complete programming tutorial about this new feature but now, if you have some knowledge of GLSL (the OpenGL shading language), you can tweak this effect file. Do not hesitate to send me feedbacks if you code a cool effect. I will post it as well as your credits! you can use optimized profiles for Enemy Territory: Quake Wars and available in NVIDIA and ATI graphics drivers. These profiles enable SLI and Crossfire. you bypass the FurMark detection included in the Catalyst graphics driver (see here and here). I think most of the important things about this new release have been said. If you have feedbacks, please them hereunder in the comments (recommended) or use this forum. New: added a GPU temperature monitoring graph in stability test mode. New: added a checkbox to enable post-processing effect in stability test mode. Post-processing effect shader is loaded from the file post-processing-fx.xml. So if you know GLSL programming, you can customize this effect shader. See on Geeks3D.com for a complete tutorial. New: added OpenGL 3.0 support. If OpenGL 3.0 is detected, the rendering is done via an OpenGL 3.0 context. 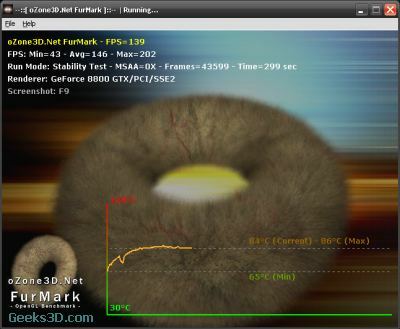 New: added start and end GPU temperatures logging in benchmark mode. Change: little interface reorganization to better handle translations with long text blocks. “In our lab tests we have discovered that when running Furmark to test for temperature, it tends to show results that would never be achieved in any circumstances (under normal running or overclocking). Running Furmark is highly risky therefore we do not recommend running this program for tests. This program pushes the VGA card to the point of maxing out, beyond limit and will burn out any cooler, stock or after market coolers after long period of testing. 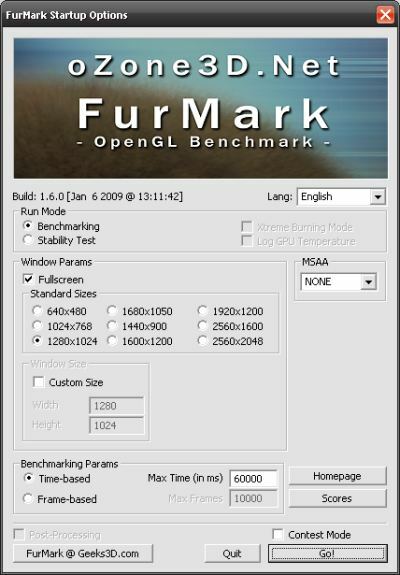 Even running games such as Far Cry 2 and GTA 4 extensively for long hours, the temperatures would never reach what Furmark’s excruciating tests put out. temperature stability, we strongly recommend ATI Tools. 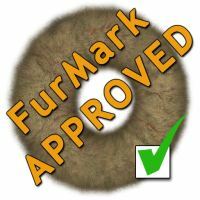 One of the most active forums about FurMark @ techPowerUp! thanks to David Legrand, Stefan and shadow for their beta-tests. The minimun isn’t updating during the test. The fist temperature is 68°C, when the fan is running, the temperature discreases to 66°C and the minimun isn’t 66 but always 68. Your english is totally understandable, mine is not better. my system just shut down. HAHAHAH! It drew so much current from my outside UPS power supply the alarms were going off. Still cool (not overheated) GPU’s tho. Neat tester. Can’t wait to start overclocking. CRYSIS running for 2 hours heats it up pretty good. I tested one thing, for fun first, then for actual testing. I own a Sapphire Radeon HD 4850, one of their reference card – with a tweaked BIOS (I set the fan to start sooner and to spin higher at a given temperature). One thing is, I mainly run under Linux; since the OpenGL stack provided by Ati/AMD is the same under Windows and Linux, and Wine maps WGL to GLX directly, performance impact on Windows OpenGL programs running under Linux/Wine is close to null; I ran FurMark on my setup. – could a native Linux version of FurMark be done? While Wine doesn’t show any slowdown in my case, there could still be some. – is it possible to add a “disable v-sync” OpenGL call? Im strongly not recommended to use this app for stress test on GPU, its killed my HD4870 x2 (original setting) after 3mins of testing. So be careful guys! !